Papaya is a palm-like, soft-stemmed, evergreen tree, Carica papaya, that is native to the tropics of the Americas, but which is now cultivated in tropical and warm, semi-tropical zones around the world. Papaya also is the name for the large, juicy, melon-like, edible fruit of this tree, which has black seeds in the center and typically ranges in color from an amber to a yellow hue. The papaya fruit is both delicious and nutritious. It provides several vitamins and minerals in significant amounts, is low in calories, and has an enzyme that is useful in tenderizing meat and for treatment of indigestion (Herbst 2001; Prior 2007). The succulent fruit with its unique flavor, texture, shape, and color adds to the sensual joy of humans. Beyond these nutritional, commercial, and aesthetic values for people, the trees and fruits also offer ecological values, providing food and habitat for insects, birds, and other animals. Thus, while the fruit and flowers of the papaya tree provide for the species individual purpose of reproduction, they also offer larger values for the ecosystem and for people. The papaya also is known as fruta bomba (Cuba and parts of Caribbean), lechosa (Venezuela, Puerto Rico, the Philippines, and the Dominican Republic), mamão, papaw (Sri Lankan English), papol\guslabu (tree melon in Sinhalese), and tree melon, as well as 木瓜 (tree melon) in Chinese and đu đủ in Vietnamese. It also is sometimes called the pawpaw (sometimes spelled papaw), although this common term more accurately applies to the small trees with large fruit of the genus Asimina. Carica, the genus to which the papaya belongs, is a taxa of flowering plants in the family Caricaceae. 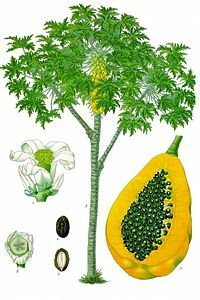 Formerly treated as including about 20-25 species of short-lived evergreen shrubs or small trees—growing to 5-10 meters tall and native to tropical Central and South America—recent genetic evidence has resulted in the genus being restricted to the single species Carica papaya (papaya; syn. C. peltata, C. posoposa). Most of the other species have been transferred to the genus Vasconcellea, with a few to the genera Jacaratia and Jarilla. The papaya, Carica papaya, is a small tree, with the single stem growing from 5 to 10 meters in height. It is considered a horticultural wonder in that it grows from a seed to a seven meter (20 foot), fruit-bearing tree in less than 18 months (Herbst 2001). The tree is usually unbranched if unlopped. The papaya has spirally arranged leaves confined to the top of the trunk. The leaves are large, 50-70 centimeters (cm) diameter, deeply palmately lobed with 7 lobes. The lower trunk is conspicuously scarred where leaves and fruit were borne. The flowers are similar in shape to the flowers of the Plumeria but are much smaller and wax-like. They appear on the axils of the leaves, maturing into the fruit. The papaya fruit tends to be large, being about 15-45 cm long (6 to 17 inches) and 10-30 cm in diameter (4 to 12 inches). The Solo variety grown in Hawaii and Florida and particularly popular in the United States is a pear-shaped, golden-yellow variety that reaches about 16 centimeters (6 inches) and 1 to 2 pounds in weight (Herbst 2001). The fruit has a large center cavity that is packed with shiny, grayish-black seeds, which are also edible but generally not eaten (Herbst 2001). The fruit of the papaya is ripe when it feels soft (like a ripe avocado or a bit softer) and its skin has attained an amber to orange hue. The fruit's taste is vaguely similar to pineapple and peach, although much milder without the tartness, as well as creamier and more fragrant, with a texture of slightly over-ripened cantaloupe. Papaya is native to the tropics of the Americas, and was cultivated in Mexico several centuries before the emergence of the Mesoamerican classic cultures. It also is native to Central America and northern South America. Today, the papaya is cultivated in most countries with a tropical or warm semi-tropical climate like Brazil, India, South Africa, Sri Lanka, and the Philippines. The ripe fruit is usually eaten raw, without the skin or seeds. It is popular as a breakfast fruit or desert. The unripe green fruit of papaya can be eaten cooked, usually in curries, salads, pies, and stews. Papaya juice also is popular. The black seeds are edible and have a sharp, spicy taste. They are sometimes ground up and used as a substitute for black pepper. In some parts of Asia, the young leaves of papaya are steamed and eaten like spinach. The fleshy fruit of papaya is high in vitamins A and C and in potassium, and has significant amounts of thiamine, riboflavin, niacin, calcium, and iron, while being low in calories (Herbst 2001; Prior 2007). The juice of unripe papaya is rich in an enzyme called papain, a protease that is useful in tenderizing meat and other proteins, as well as used as a treatment for indigestion. Its ability to break down tough meat fibers was utilized for thousands of years by indigenous Americans. It is included as a component in powdered meat tenderizers. It also is marketed in tablet form to remedy digestive problems. Furthermore, papain is popular in countries where it grows as a topical application in the treatment of cuts, rashes, stings, and burns. Papain ointment commonly is made from fermented papaya flesh and is applied as a gel-like paste. The actor Harrison Ford was treated for a ruptured disc incurred during filming of Indiana Jones and the Temple of Doom by having papain injected into his back. The mature (ripe) fruit also has been used to treat ringworm while green fruits have been used to treat high blood pressure. The seeds are considered to be anti-inflammatory and analgesic (pain reliever), and they are used to treat stomachache and fungal infections, while the leaves have been used as a heart tonic, analgesic, and to treat stomachache. 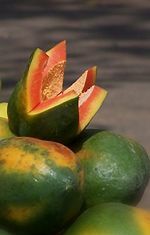 Women in India, Pakistan, Sri Lanka, and various other parts of the world have used papaya as a folk remedy for contraception and abortion. Medical research in animals has confirmed the contraceptive and abortifacient capability of papaya, and also found that papaya seeds have contraceptive effects in adult male langur monkeys, possibly in adult male humans as well (Lohiya et al. 2002; Oderinde et al. 2002). Unripe papaya is considered to be especially effective in large amounts or high doses. Papaya is not considered to be teratogenic (causing birth defects) and will not cause miscarriage in small, ripe amounts. Phytochemicals in papaya seeds may suppress the effects of progesterone (Oderinde et al. 2002). Papaya. Moche Culture. Larco Museum Collection. 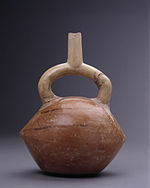 The Moche often depicted papayas in their ceramics (Berrin 1997). Caution should be taken when harvesting, as papaya is known to release a latex fluid when not quite ripe, which can cause irritation and provoke an allergic reaction in some people. The papaya fruit and leaves also contains carpaine, an anthelmintic alkaloid, which could be dangerous in high doses. Berrin, K., and Museo Arqueológico Rafael Larco Herrera. 1997. The Spirit of Ancient Peru: Treasures from the Museo Arqueológico Rafael Larco Herrera. New York: Thames and Hudson. ISBN 0500018022. Duke, B. 2005. Harrison Ford: The Films. Jefferson, NC: McFarland. ISBN 0786420162. Lohiya, N. K., B. Manivannan, P. K. Mishra, N. Pathak, S. Sriram, S. S. Bhande, and S. Panneerdoss. 2002. Chloroform extract of Carica papaya seeds induces long-term reversible azoospermia in langur monkey. Asian Journal of Andrology 4: 17–26. Retrieved November 18, 2006. Oderinde, O., C. Noronha, A. Oremosu, T. Kusemiju, and O. A. Okanlawon. 2002. Abortifacient properties of Carica papaya (Linn) seeds in female Sprague-Dawley rats. Niger Postgrad Medical Journal 9(2): 95-98. PMID 12163882. Prior, M. 2007. Papaya: Helping you lose weight deliciously! Alternative-medicine online. Retrieved October 9, 2007. Fruits of Warm Climates: Papaya and Related Species.